I have very full cupboards. About every type of nut & oil that exists, herbs and spices, if they are out there, I have it. Every type of flour, including the ones I don’t use often and personally don’t consume. My freezer at the moment, just off the top of my head, has multiple containers of 2 types of soup, meat sauce, frozen vegetables, asparagus, brussel sprouts, other herbs, salmon, tilapia, ground turkey, not to mention whats in the pantry and fridge….. 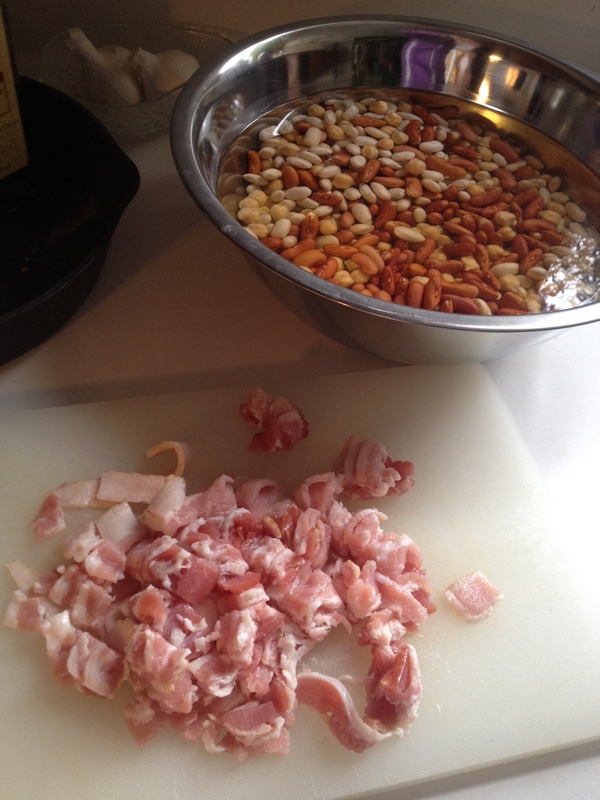 I had a handful of dried chickpeas, a couple handfuls of cannellini beans and kidney beans weighing 1 lb all together. I had a quart of Turkey breast broth left over from Thanksgiving weekends Turkey Potpie preparation and some bacon. In my 9 Qt. Alluminum pot I sautéed the chopped bacon and let cook until the fat was melted but not yet crisp, then I added the onion, carrot and celery that I chopped using the grater disc with my food processor and let sauté until the onion was transparent, then added the chopped garlic, thyme and rosemary twigs and lightly salted and peppered the ingredients. I added the beans, ( soaked overnight and rinsed), then the diced potatoes and let sauté a few more minutes. I added the Turkey broth and 1/2 a qt. of water and let boil at medium heat about 15 minutes and then added another 1/2 Qt. Water. I added water as it cooked. 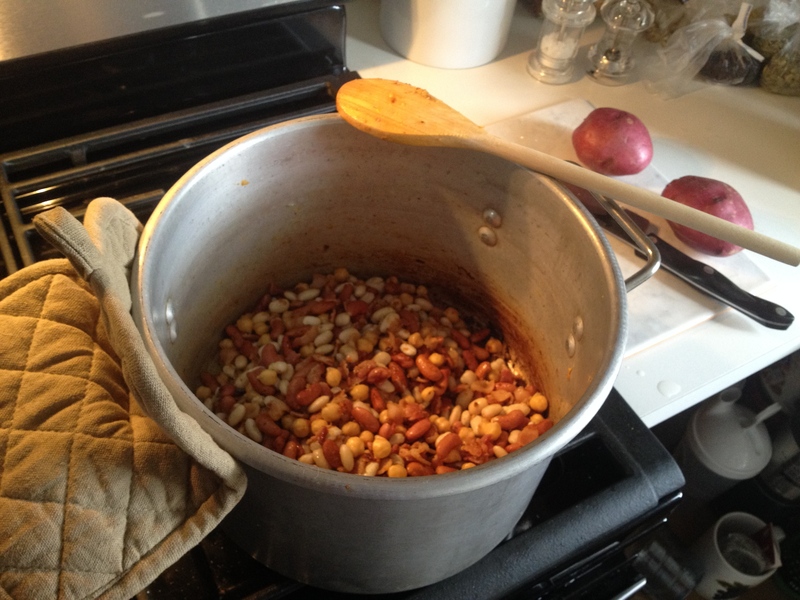 The soup simmered about 1 1/2 hours, until the beans were soft. I let the soup cool about a 1/2 hour and used my hand immersion blender to puree or cream the soup a little, just a few pulses and it was ready and delicious! * If you do dairy, I recommend 3 Bean Soup with grated Parmeggiano.